An improvement of the design of the Grumman Mallard, the Albatross was developed to land in open ocean situations to rescue downed pilots. Its deep-V cross-section and substantial length enable it to land in the open sea. The Albatross was designed for optimal 4 ft seas, and could land in more severe conditions, but required JATO for takeoff in 8-10 ft seas or greater. Since the aircraft weighs over 12,500 pounds, pilots of US-registered Albatross aircraft must have a type rating. There is a yearly Albatross fly-in at Boulder City, Nevada where Albatross pilots can become type rated. 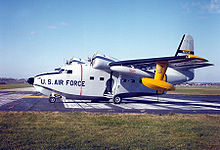 The majority of Albatrosses were used by the U.S. Air Force, primarily by the Air Rescue Service, and initially designated as SA-16. The USAF utilized the SA-16 extensively in Korea for combat rescue, where it gained a reputation as a rugged and seaworthy craft. Later, the redesignated HU-16B (long-wing variant) Albatross was used by the U.S. Air Force's Aerospace Rescue and Recovery Service and saw extensive combat service during the Vietnam conflict. In addition a small number of Air National Guard Air Commando Groups were equipped with HU-16s for covert infiltration and extraction of special forces from 1956 to 1971. The U.S. Navy also employed the HU-16D Albatross as a Search and rescue (SAR) aircraft from coastal naval air stations, both stateside and overseas. It was also employed as an operational support aircraft worldwide and for "skunk runs" from the former NAS Agana, Guam during the Vietnam War. Goodwill flights were also common to the surrounding Trust Territory of the Pacific Islands in the early 1970s. Open water landings and water takeoff training using JATO was also conducted frequently by U.S. Navy HU-16s from locations such as NAS Agana, Guam; Naval Station Guantanamo Bay, Cuba; NAS Barbers Point, Hawaii; and NAS Pensacola, Florida, among other locations. The HU-16 was also operated by the U.S. Coast Guard as both a coastal and long-range open ocean SAR aircraft for many years until it was supplanted by the HU-25 Guardian and HC-130 Hercules. The final Navy HU-16 flight was made 13 August 1976 when an Albatross was delivered to the Naval Aviation Museum at NAS Pensacola. In the mid-1960s the U.S. Department of the Interior bailed 3 military Grumman HU-16's from the U.S. Navy and established the Trust Territory Airlines in the Pacific to serve the islands of Micronesia. Pan American World Airways and finally Continental Airlines' Air Micronesia operated the Albatrosses serving Yap, Palau, Chuuk (Truk) and Pohnpei from Guam until 1970, when adequate island runways were built, allowing land operations. In 1970, Conroy Aircraft marketed a remanufactured HU-16A with Rolls-Royce Dart turboprop engines as the Conroy Turbo Albatross, but only the single prototype (registration N16CA) was ever built. Many surplus Albatrosses were sold to civilian operators, mostly to private owners. These aircraft are operated under either Experimental - Exhibition or Restricted category and cannot be used for commercial operations, except under very limited conditions. In the early 1980's Chalk's International Airlines owned by Merv Griffin's Resorts International had 13 Albatrosses converted to Standard category as G-111's. This made them eligible to be used in scheduled airline operations. These aircraft had extensive modification from the standard military configuration, including rebuilt wings with titanium wing spar caps, additional doors and modifications to existing doors and hatches, stainless steel engine oil tanks, dual engine fire extinguishing systems on each engine and propeller auto feather systems installed. The G-111's were only operated for a few years and then put in storage in Arizona. Most are still parked there, but some have been returned to regular flight operations with private operators. In March 2009 ABC News reported that an Albatross flown for the energy drink maker "Red Bull" had been grounded at least twice and had been the subject of an FAA safety investigation concerning its safe flight. The pilot/operator of the "Red Bull" Albatross airplane later went on to operate and fly the Grumman Mallard used in the 2010 movie The Expendables featuring Sylvester Stallone. On 5 November 2009, Albatross N120FB of Albatross Adventures crashed shortly after take-off from St. Lucie County International Airport, Fort Pierce, Florida. An engine failed shortly after take-off, the aircraft was damaged beyond economic repair. XJR2F-1 - Prototype designation, two built. Picture - Preserved Hellenic AF aircraft at Dekelia AB. HU-16B, AF Serial No. 51-5282, at the National Museum of the United States Air Force, Wright-Patterson AFB, Ohio. This was USAF's last operational HU-16. On 4 July 1973 it established a world record for twin-engine amphibians when it reached 32,883 feet. Two weeks later it was flown to the Air Force Museum. HU-16B, AF Serial No. 51-7176, was at the Pate Museum of Transportation in Cresson, Texas. It is being disassembled and moved to Coast Guard Air Station Clearwater in Clearwater, Florida where it is to be restored. HU-16C, US Navy Albatross displaying NAS Alameda and designation number 1911, assigned to USS Carl Vinson. Currently located on the north end of the field at Charles M. Schulz - Sonoma County Airport in reportably flyable condition. Jimmy Buffett's Hemisphere Dancer, now the centerpiece of Universal Studios' Margaritaville Cafe in Orlando, Florida. Swimwear manufacturer Billabong operates a well-equipped Albatross for surf touring. Quiksilver also operates a similarly-equipped Albatross for surf touring. Several private owners have Albatrosses equipped with sleeping quarters which can be used as an airborne recreational vehicle (sleep-aboard), either at an airport or on the water. Two HU-16Bs of the Hellenic Air Force are on display at Dekelia (Tatoi) Air Base, north of Athens. HU-16E of the United States Navy (BuNo 141266) and an HU-16E of the U.S. Coast Guard (USCG 7236) at the National Museum of Naval Aviation at NAS Pensacola, Florida. These aircraft were the last operational HU-16s in their respective services. HU-16A, AF Serial No. 51-0022 at the Pima Air and Space Museum in Tucson, Arizona. HU-16E, USCG 7250, at CGAS Cape Cod at Otis Air National Guard Base, Massachusetts. HU-16B, AF Serial No. 51-1280, adjacent to the 58th Special Operations Wing compound at Kirtland AFB, New Mexico. HU-16E, USCG 7247, at CGAS Elizabeth City, North Carolina. HU-16B, N44HQ, owned and operated by Row 44 and equipped with in-flight WiFi as a test and marketing tool. HU-16B at Warfield Air National Guard Base, in Baltimore, Maryland. Dorr, Robert F. "Albatross - Amphibious Airborne Angel". Air International, October 1991, Vol. 41, No. 4. ISSN 0306-5634. pp. 193-201. Swanborough, Gordon and Peter M. Bowers. 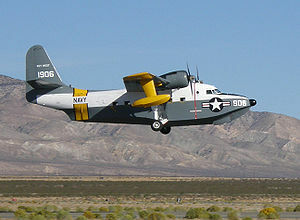 United States Navy Aircraft since 1911. London:Putnam, Second edition, 1976. ISBN 0 370 10054 9. 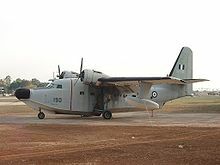 Grumman HU-16 Albatross Pictures and Grumman HU-16 Albatross for Sale.